I love making roast chicken. My neighbor was making a roast chicken a few weeks ago stuffed with lemons. It smelled so delicious and made the chicken so flavorful that I decided to try using lemons in my roast too. I also made a fig and pear compote to serve over the chicken when it was done. This can be pureed for little ones 7+ months, or served in bite size pieces for older babies eating finger foods. Preheat oven to 350F. Rinse chicken inside and out. Pat dry with paper towel, place in roasting dish and spray generously with olive oil spray. Season with a little salt and pepper. Sprinkle with Herbs de Provence and juice of 1/2 lemon (reserve other half of lemon for compote). Cut up remaining 2 lemons and stuff them in the cavity of the chicken. Place in oven and roast for 1 1/2 hours or until meat thermometer reads 160F in breast or 180F in thigh. When there is about 5 to 10 minutes left on chicken timer start making the compote. Spray a medium to large nonstick skillet with olive oil cooking spray. Add diced pear and chopped figs. Sprinkle with cinnamon, nutmeg, salt and pepper. Add maple syrup, lemon juice and chicken stock. Toss to coat. Cook until pears are tender about 5 minutes. 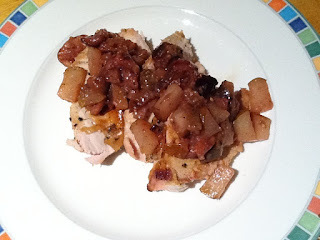 Slice chicken and spoon compote over the chicken and serve. Serving size for your little one is about 1/2 cup of bite size pieces.